Okay, first off, I know this theory seems a bit nutty, but just hang with me. 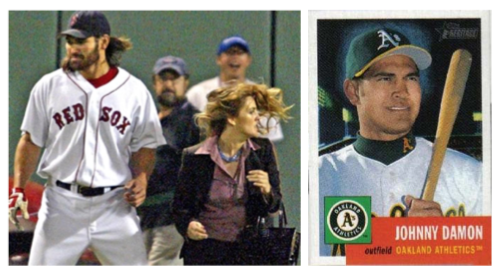 Jimmy Fallon and Brad Pitt are my two favorite actors, so needless to say I’ve seen Moneyball and Fever Pitch dozens of times, but it wasn’t until a few days ago, after a serious B-Pitt/J-Fall binge that I realized just how similar these two movies are. Fever Pitch takes place in 2004, and Moneyball takes place in 2002, so I’m not insinuating that they overlap in anyway. Rather, I’m saying that Fever Pitch is a sequel to Moneyball. 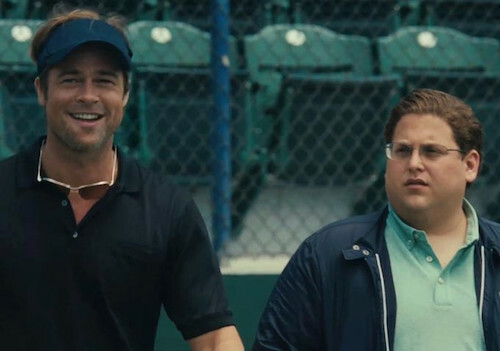 Or, better yet, Moneyball is a PREQUEL to Fever Pitch since it came out a few years later. The first similarity I noticed has to do with a baseball team called “The New York Yankees.” In the opening scene of Moneyball, Brad Pitt’s team is playing the “Yankees.” Pitt looks super stoic and cool as he watches the game from a little TV. It’s a dope movie. He also chews tobacco like a cowboy and is friends with fat people. You should check it out if you haven't seen it. Anyway, the “Yankees” also appear in Fever Pitch during a scene when Jimmy Fallon tells Drew Barrymore that he is going to “Spring Training” to see the “Red Sox” play. Barrymore mentions to Fallon that she’s seen his “Yankee toilet paper.” This is also a great seen, and I can’t recommend Fever Pitch enough if you’re a Jimmy Fallon fan and have seen Taxi too many times to count and are looking for something fresh. LOL as if this movie isn't always fresh. The “Yankees” appear in both films. Coincidence? Probably not. Let’s continue. Later on in both movies, we hear rumblings of a character named “Babe Ruth.” Ruth is supposedly an older gentleman who played “baseball” years ago. Pitt mentions him in that awesome scene where he’s talking with his talent scouts, and Fallon mentions Ruth when he’s explaining to Barrymore why his “Red Sox” are cursed - I know, freaky right? At this point, I was pretty certain that something was up. I mean, I know these movies were made by different studios, but maybe some producer worked on both projects. I'm sure this was just a coincidence.... NOT! In other words, not only does Fever Pitch and Moneyball share characters, they share character DEVELOPMENT! It would be so sweet if we could get another movie that tells us Johnny Damon’s entire backstory. Anyway, I know this is kind’ve an absurd fan theory. I’m going to rewatch both movies a few more times this week to see if I can catch any other similarities!